Kia’s updated Optima and Optima Sportswagon are now available to order, introducing revised design, increased technology and a new 1.6-litre diesel. Revealed at the Geneva Motor Show this spring, the facelifted saloon and estate – which are mainly targeted at the fleet market – get a new 1.6-litre diesel, intended to bring a lower-emission replacement to the previous 1.7-litre and also seen in the third-generation Ceed. The new Euro-6d Temp powertrain is available with six-speed manual and seven-speed DCT and brings up to 61.4mpg fuel economy, with CO2 emissions from 117g/km under NEDC Correlated figures. The previous 1.7-litre emitted 110g/km under true NEDC figures. CO2 emissions for the Sportswagon start from 121g/km when paired with a manual gearbox. Kia has also introduced a new Optima Sportswagon GT model powered by a 241bhp 2.0-litre turbocharged petrol engine. 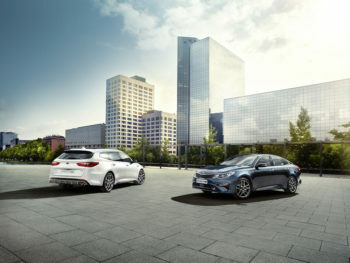 Other changes for the standard models introduce updated exterior and interior design, including revised front bumpers and new steering wheel, and Kia’s latest active safety and in-car connectivity technologies, including Driver Attention Warning and Forward Collison – Avoidance Assist. The refreshed Optima is available with Kia’s latest 7.0 or 8.0-inch touchscreen infotainment system, with satellite navigation and Kia Connected Services powered by TomTom, and Apple CarPlay and Android Auto functionality. It also features a wireless smartphone charger. The Optima also debuts a new Drive Mode Selector with Eco, Comfort, Sport and Smart modes, and a new high-resolution Around View Monitor parking camera. Trim lines cover ‘2’ and ‘3’ for the saloon along with an additional ‘GT-Line S’ for the Sportswagon. Prices start from £22,260 for the Saloon ‘2’ 1.6 CRDi 6-speed manual ISG to £31,400 for the Sportswagon ‘GT-Line S’ 1.6 CRDi 7-speed DCT ISG.